Polish composer (1810-1849). Autograph letter signed „Ch“. „chateau de Nohant pres La Chatre. 8vo. 4 pp. With autograph envelope, with red seal, creased at folds. To his beloved friend the cellist Auguste Franchomme, about his music, especially the Polonaise Fantasie Op.61. Writing from Nohant to Franchomme who was acting for him in Paris, he expresses his annoyance that his publisher [Brandus] is away and that there is no one to take possession of his manuscripts, he requests that the name of Madame Veyret be added as dedicatee of the Polonaise-Fantaisie Op.61, he discusses financial matters relating to the publication of his music, relays the best wishes of George Sand and asks to be remembered to Jane Stirling, his last love, ...Aussi aye la bonté de ne pas leur confier mes manuscrits sans toucher l'argent convenu, et envoye m'en aussitôt un billet de cinq cents fr. dans ta lettre...Garde-moi tes millions pour autre fois...Ajoute...au titre de la Polonaise "dédiée à Madame A. Veyret"... This autograph letter has only been offered for sale at Sotheby’s in 2011, lot 230. It has come by descent through the Franchomme family. This letter is inaccurately published in Sydow (no.622), who silently corrects Chopin's grammatical mistakes and changes certain words..
Polish composer (1810-1849). Autograph letter signed „Chip“. Manchester. 8vo. 4 pp. Eratures on the last page. Tiny traces of collage at the corners. Unpublished letter written on his trip through to England, after he held his concert in Manchester on August 28 to his friend Thomas Albrecht, consul of Saxony in Paris and wine merchant (6 place Vendome), and dedicatee of the Scherzo in B minor op. 20. Chopin was the godfather of this daughter Thérèse. „[…] Dans cet endroit enfumé il y a une salle de musique la plus charmante possible. La ville y a donné un splendide concert. On a engagé ALBONI, CORBARI – on a eu l’heureuse idée de m’engager aussi. – Pour avoir joué 2 fois on m’a envoyé 60 £ (1500 fr – je crois)“, that he sent him in the form of a draft to London, through Mr. Schwabe, with whom he lived in the country near Manchester. He asks him to „faire payer avec cela le reste de votre note Place Vendôme – et 300 fr de mon loyer du Square [his home at Square d’Orléans] ainsi que les contributions dont je ne sais le montant. S’il n’y a pas assez pour tout cela – ayez la bonté de payer le percepteur et mon propriétaire avant vous“; he gives his address in Edinburgh to Dr. Lishinski „Donnez moi je vous prie de vos bonnes nouvelles – que vous êtes tous heureux et bien portant à Ville d’Avray, que vous avez meilleur temps qu’ici. – Malgré cela je quitte Manchester aujourd’hui pour aller en Écosse passer quelques semaines encore loin de Londres – et puis je ne sais ce que je ferai. – J’étoufferai, et je tousserai c’est sûr, et je vous aimerai tout autant“. He is erasing 5 lines and notes: „Je n’ai plus le temps de faire une autre lettre“, and he adds: „J’embrasse vos chers enfants. Dieu vous donne à tous deux le plus de bonheur possible. […] Si vous aviez moins de brouillons ou Londres moins de brouillards !“ He will write to „bon Kwiat“ [his friend the painter Teofil Kwiatkowski]..
Chopin pens seven lines, seemingly concerning a concert program. In part: “4. Sonatas Weber…Beethoven Sonata…primeur Concertos…Field 2nd Concerto…3rd Concerto.” An identification notation in another hand is penned below. Intersecting folds with a partial separation to a horizontal fold (passing through the last line of Chopin’s writing), heavy overall creases, and a few edge tears, otherwise very good condition. Accompanied by an export certificate from the French Ministry of Culture. This brief note was presumably prepared for a concert program or perhaps a pupil, and lists works by composers greatly admired by Chopin—Carl Maria von Weber, Ludwig van Beethoven, and John Field. Chopin is rare in any format, and this is a magnificent piece with crisp writing and extraordinary musical associations. Assignment of copyright for his Op. 28 and Op. 30. In part: “U have this day sold to Messrs. Christian Rudolph Wessel & Co. Importers and Publishers of Foreign Music…all my Copyright and Interest, present and future…for the Kingdom of Great Britain…of and in the following Compositions (in M.S.) to be published conjointly in France & Germany in: Op. 28. Impromptu pour le Piano Solo dedie a Madame la Comtesse d’Agoult—to appear the 14th October 1837, Op. 30, Quatre Mazurkas being his 5th Set, dedicated to La Princesse de Wurtemberg.” Signed twice at the conclusion by Chopin. A small repaired area of paper loss to right edge and chips to two corner tips, otherwise fine condition. Wessel & Co. had the exclusive rights to publish Chopin’s works in England, and the company was taken over by Edwin Ashdown and Henry Parry upon his retirement. 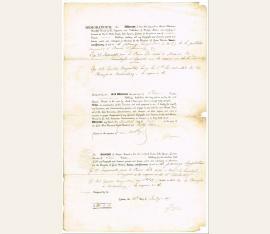 This document originates from the collection of the Ashdown family and has never before been offered for sale. The document notes that the first piece is dedicated to Marie d’Agoult, a friend of Chopin and the mistress of Franz Liszt. The second, dedicated to Princess Maria Wirtemberska of Wurttemberg, is a set of four pieces based on the traditional Polish dance. Chopin is among the most desirable autographs of all composers and exceedingly rare in this twice-signed format. 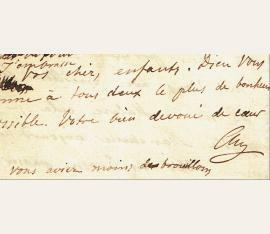 Document signed twice ("F. F. Chopin"). Rare document ("Memorandum") by which Chopin sold to the London-based music publishers C. R. Wessel & Co. the British (but not French or German) copyright for two piano works. A printed form filled in by hand, it reads (in part): "I have this day sold to Messrs. Christian Rudolph Wessel & Co. Importers and Publishers of Foreign Music [...] at the price or sum of Ten Pounds, - Shillings, sterling, all my Copyright and Interest, present and future, vested and contingent or otherwise, for the Kingdom of Great Britain [...] of and in the following Compositions (in M.S.) to be published conjointly in France & Germany, viz: Op. 28. 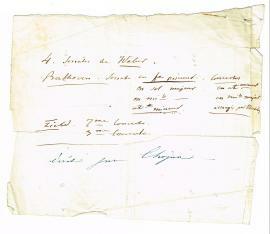 Impromptu pour le Piano Solo dedié à Madame la Comtesse d’Agoult - to appear the 14th October 1837; Op. 30, Quatre Mazurkas being his 5th Set, dedicated to La Princesse de Wurtemberg [...]". Signed twice by Chopin (once for the assignment of copyright, once for the receipt of the funds), and counter-signed as witness by Chopin's friend, the the piano-maker and publisher Camille Pleyel. - The latter-named work, dedicated to Princess Maria Anna Czartoryska of Württemberg (Maria Wirtemberska), is a set of four pieces based on the traditional Polish Mazurka dance. Confusingly, "Opus 28" is in fact a set of 24 Preludes commissioned by Pleyel, and dedicated to the German pianist and composer Joseph Christoph Kessler. They were not published until 1839. Chopin's first published "Impromptu" (No. 1, in A flat major), on the other hand, composed in 1837 and published in December of that year, was Op. 29, which he dedicated to his pupil Lady Caroline de Lobau, while his Opus 25, "Douze Études", was indeed published in October 1837 with a dedication to Marie d'Agoult, a friend of Chopin's and the mistress of Franz Liszt. Interestingly, it appears that in July of 1837 Chopin was as yet undecided as to the title and dedicatee of what was to become opus 25 or 29; it also seems likely that the English publishers misread either figure in Chopin's manuscript for "28". - Founded by the Bremen-born Christian Rudolf Wessel (1797-1885), Wessel & Co. was active in publishing from 1824 onwards. Wessel began to publish the works of Chopin in 1833, later gaining exclusive British publishing rights for him. In 1860, Wessel retired and transferred his business to Edwin Ashdown and Henry John Parry, who had been his managers. 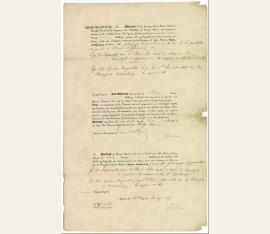 This document originates from the collection of the Ashdown family. 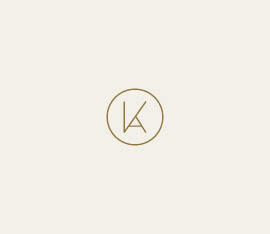 - A small repaired area of paper loss to right edge and chips to two corner tips, otherwise in fine condition.